This resource was originally posted by the U.S. Department of Education. In a continuing effort to inform the community of stakeholders who care for our children and to respond to continuing demand from the field, the Department of Education released in January 2017 a new resource guide for early learning educators and families as a follow-up to a 2015 Resource Guide focused on secondary students.The resource guide includes two parts. 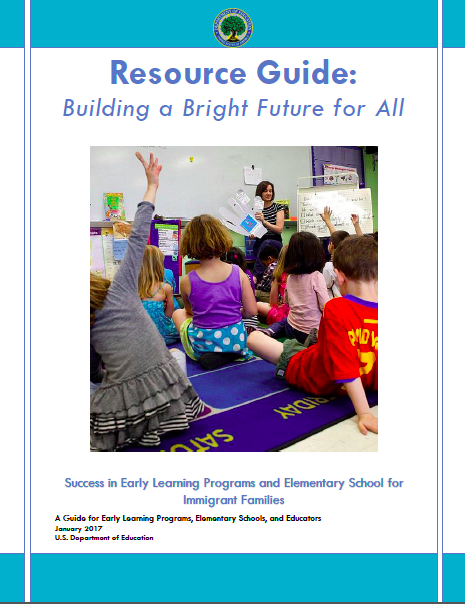 The first half of the resource guide, entitled Resource Guide: Building a Bright Future for All, provides tips for educators in early learning programs and elementary schools as well as schools, districts, and States to (1) facilitate school enrollment by immigrant families; (2) promote healthy child development in the school setting; (3) encourage caregiver engagement in children’s education; and (4) build staff capacity and knowledge about immigrant students and their educational needs.